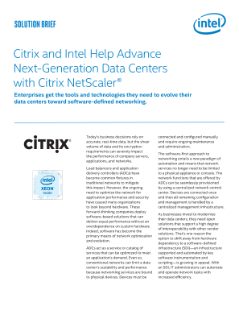 Enterprises can move toward software-defined network infrastructures with the Intel® Xeon® processor E5 family and Citrix NetScaler*, which enables enterprises to cut down on operation and hardware costs and increase the agility and scalability of the applications that reside in their on-premises and cloud-based data centers. The architecture and integrated technology of the Intel® Xeon® processor... E5 family supports the Citrix software-first strategy with improved encryption, performance, and data availability. NetScaler is designed to maximize the performance of these multi-core processors to help increase operational efficiency in your data center. By playing off of one another’s strengths, the Intel® Xeon® processor E5 family and NetScaler are able to move more data more quickly through your data center. Success! Thanks for signing up for Bit Feed. Your email with the Intel perspective on the week's top cloud and big data stories will arrive every Friday morning – enjoy!